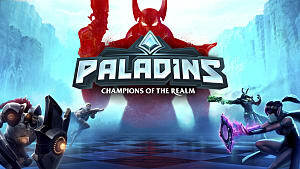 Paladins is a free-to-play, team-based first person shooter arena game. 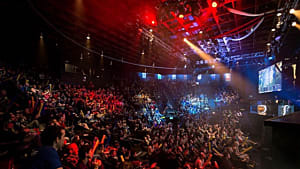 Released in September 2016 as an early access product by Hi-Rez Studios, the game is currently in beta on consoles and has entered its first full season on PC. 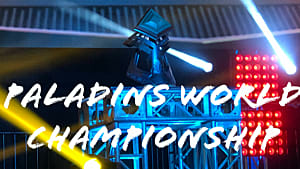 In the game, each player controls a champion character with differing abilities, and 10 players are split into two teams of 5 to fight over and secure objectives. 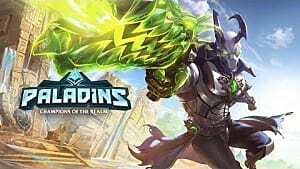 Within a week of its release on Steam, Paladins has attracted over 5,400,000 downloads. That means there are a lot of beginners who are looking for the perfect champion to rule the arena. 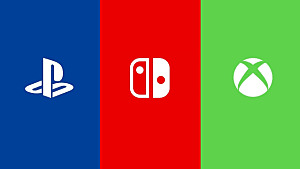 That's where this list comes in. 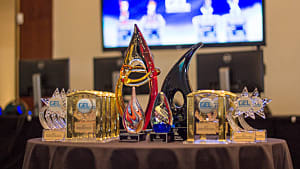 These 5 champions are your best bet if you're just starting out with the game and want to find your footing. 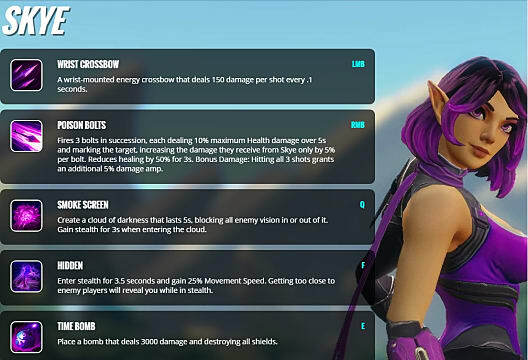 All the champions mentioned here are completely free and unlocked from the moment you start to play, making them perfect for a new player to try out, practice with, and "git gud". 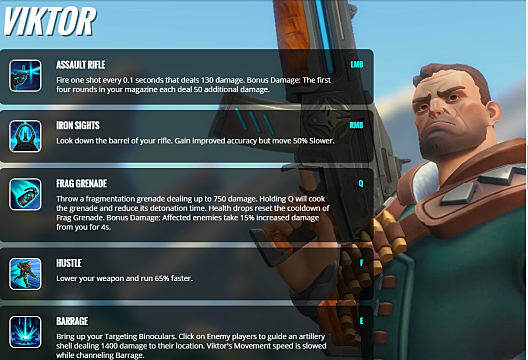 Viktor is a damage champion, and his kit will be familiar to those of you that have played a first person shooter game before. Damage champions gain 100% more Credits for dealing damage to enemy champions, which is great since will be your only job when playing as Viktor. Assault Rifle: Fire one shot every 0.1 seconds that deals 130 damage. The first four rounds you shoot each deal 50 additional damage. Iron sights: You look through the sight of your rifle gaining improved accuracy but lowering your movement speed by 50%. Hustle: You lower your weapon to run 65% faster. Barrage: Bring up your targeting binoculars and click on enemy players to guide an artillery shell, dealing 1400 damage to their location. Pip is a support champion. They are helpful in both offense and defense. Support champions gain 100% more Credits for healing allies. They also gain ultimate charge from healing done to teammates besides themselves. Potion Launcher: You can shoot volatile potions every 1 second that explode in an area, dealing 600 damage per hit. Explosive Flask: Fire an explosive flask that deals 150 damage and slows enemies by 50% for 2.5 seconds. Increases the damage of your next shot by 20%. 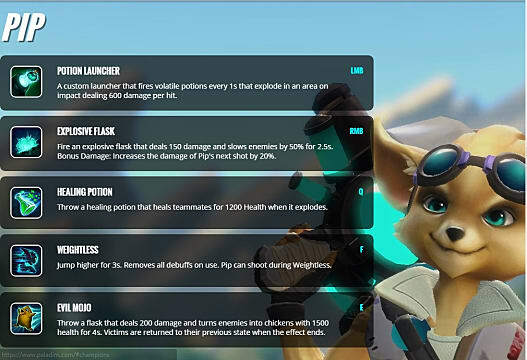 Healing Potion: Throw a healing potion that heals teammates for 1200 health when it explodes. The potion explodes in contact with an ally or terrain. Weightless: You can jump higher for 3 seconds. Also removes all the debuffs currently active. You can shoot during Weightless, and it makes Pip jump once upon activation. Evil Mojo: Throw a flask that deals 200 damage and turns enemies into chickens with 1500 health for 4 seconds. Skye is a flanker champion, which means that knowing the maps beforehand will help you keep surprising the enemy team. She excels at ganking and taking out key targets from the opponent's rear. Flank champions gain 100% more Credits for eliminations on enemies when they are behind enemy lines. She is the kind of champion you can use to carry your team in ranked gameplay when you get good with her and know the maps well. Wrist Crossbow: A wrist-mounted energy crossbow that deals 150 damage per shot every 0.1 seconds. Poison Bolts: Fires 3 bolts in succession, each dealing 10% maximum health damage over 5 seconds and marking the target, increasing the damage they receive from you by 5% per bolt. Reduces healing on target by 50% for 3 seconds. Hitting all the shots grants a 5% damage boost. Smoke Screen: You create a cloud of darkness that lasts for 5 seconds, blocking all enemy vision in and out of it. Also you gain stealth for 3 seconds when entering the cloud. Hidden: Enter stealth for 3.5 seconds and gain 25% more movement speed. Remember that getting too close to enemy players will reveal you while in stealth. Can be cancelled early by re-activating the skill. Time Bomb: You place a bomb that deals 3000 damage and destroys all shields. This ultimate doesn't show up as warning sign anymore, making it more difficult for enemies to locate the bomb or escape. 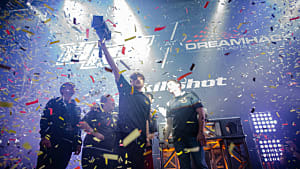 Fernando is a front liner champion, which makes him good at holding the line and protecting teammates. Front Line champions gain 100% more Credits for standing near an objective. Your job as Fernando will be a pretty standard tank role -- trying to protect your teammates so they can rain hell down on the other team. Flame Lance: A short range flamethrower that deals 30 damage per hit every 0.1 seconds and apply a damage over time effect for 200 damage over 2 seconds. Shield: Expand your shield to block 8.000 damage. Cannot attack while using it. It can last up to 10 seconds. Can be cancelled early by re-activating the skill, using Fireball or Immortal, and by emoting. Fireball: A ball of fire that deals 450 damage and reduces healing by 50% for 3 seconds. Fireball deals 50% more damage for each consecutive target it hits after the first. Deals area damage. Charge: Allows you to dash forward at great speed while dealing 200 damage to every enemy you hit. Fernando can toggle Shield on and off while charging. 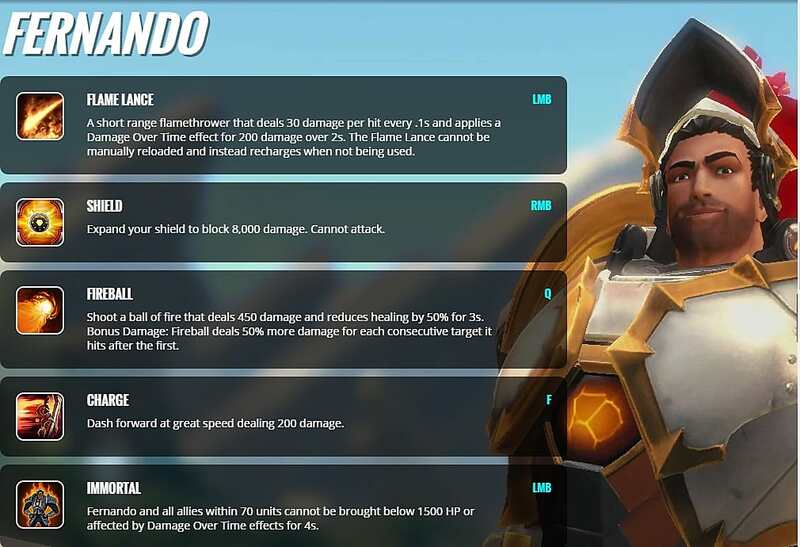 Immortal: Fernando and all allies within 70 units cannot be brought below 1500 health or affected by damage over time effects for 4 seconds. 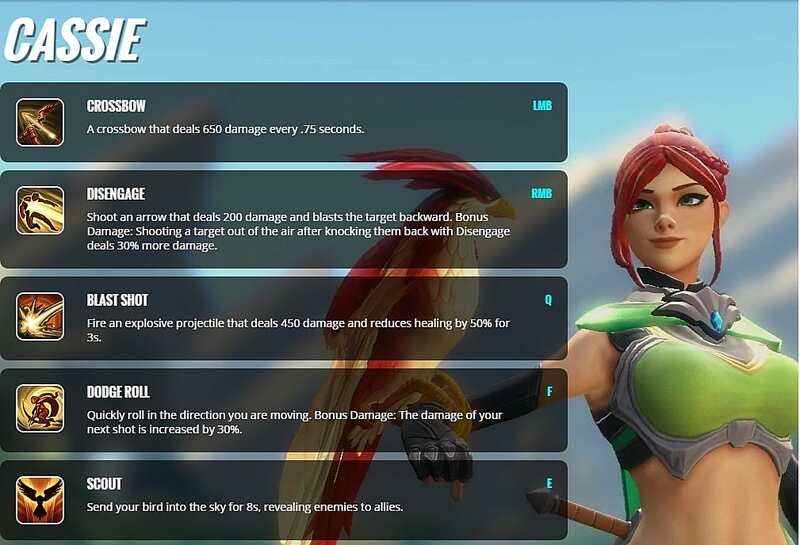 Cassie is another damage champion just like Viktor. Your job is to kill, kill, and kill some more. Be warned, people tend to insta-lock her...so if you want to play with her you need to be fast with your selection. Crossbow: A crossbow that deals 650 damage every 0.75 seconds. Disengage: Shoot an arrow that deals 200 damage and pushes the target backwards. Shooting a target out of the air after knocking them back with Disengage deals 30% more damage. Blast Shot: Fire an explosive projectile that deals 450 damage and reduces healing by 50% for 3 seconds. Knocks Cassie back if she hits herself with the explosion. Dodge Roll: Quickly roll in the direction you are moving. The damage of your next shot will be increased by 30%. Scout: Send your bird into the sky for 8s, revealing enemies to allies. This ult has a global range, and Cassie is immune to Crowd Control for the duration. All five of these champions are more than viable for a new player who is looking to learn. 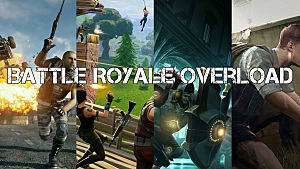 So decide what role you want to try first, choose the champion that seems most appealing to you, and get good at them. But don't forget the most important part -- have fun!